Edward the Confessor lived from 1003 to 1066, son of Ethelred the Unready and Emma of Normandy, was one of the last Anglo-Saxon kings of England and is usually regarded as the last king of the House of Wessex, ruling from 1042 to 1066. He has traditionally been seen as unworldly and pious, and his reign as marking the continuing disintegration of royal power in England and the advancement in power of the earls. However, modern historians regard him as a successful king, who was energetic, resourceful and sometimes ruthless, but whose reputation has been unfairly tarnished by the Norman conquest shortly after his death. Edward was canonized in 1161 by Pope Alexander III, and is commemorated on 13 October by the Roman Catholic Church, the Church of England and other Anglican Churches. He is regarded as the patron saint of kings, difficult marriages, and separated spouses. He is also the co-patron (with St Edmund of Bury and St George) of England. From the reign of Henry II of England to 1348, he was considered the patron saint of England. During the reign of Edward III of England he was replaced in this role by Saint George, though Edward has remained the patron saint of the British Royal Family. In 1163, the newly sainted king’s remains were enshrined in Westminster Abbey with solemnities presided over by Thomas Becket, Archbishop of Canterbury. At the time of Edward’s canonisation, saints were broadly categorised as either martyrs or confessors. Martyrs were people who had been killed for their faith, while confessors were saints who had died natural deaths. Edward was accordingly styled Edward the Confessor, partly to distinguish him from his predecessor Edward the Martyr. The shrine of Saint Edward the Confessor remains where it was after the final relocation of his body in the 13th century, by Henry III – at the heart of Westminster Abbey, where the date of his translation, 13 October, is observed as a major feast. 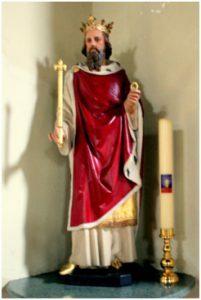 Our Parish joins with the Abbey community and parish to commemorate the feast of St Edward on the 13th October every year. In the Roman Catholic Church, the feast day of Edward the Confessor is on 5 January, the anniversary of his death. It was moved in 1969 to this date from 13 October, the anniversary of a translation of his relics, at which it had been placed in 1679, when first inserted into the Roman Catholic calendar of saints.